Launched in 2003, Ruby Fortune is an absolute gem of a casino, which is premised around four guiding principles: fair, easy, safe and fun. As part of the established Palace Group family of online casinos, Ruby Fortune is fully licensed by the Malta Gaming Authority and has the approval of independent regulatory body, eCOGRA, which is only awarded if the casino in question adheres to fair gameplay, fast payouts and, of course, responsible casino conduct – all of which Ruby Fortune most certainly does. With over 500 high-quality games on offer, including blackjack, roulette, baccarat, slots and more, there is no end to the exciting entertainment and rewarding winning opportunities. Let’s take a closer look. 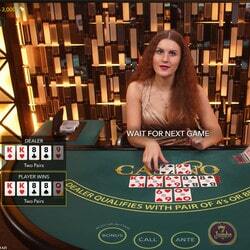 One of the most exciting features at Ruby Fortune is their Live Dealer facility. Here, you’ll be able to access a wide range of thrilling, action-packed live table and card games. Think of Live Dealer as a kind of bridge between the world of the online casino and the world of the bricks-and-mortar casino. Basically, you’ll be able to stream actual blackjack, roulette, baccarat and poker games onto your PC or mobile device and play against a real dealer in real time, either from the comfort of your home or while you’re on the move. Now that’s convenience. The dealer will also be able to interact with you, plus you’ll be able to communicate with other players, just like you would if you were playing at a land-based casino: this is one of the elements that makes playing at Live Dealer tables so exciting – it’s just so authentic. What’s more, it’s all in high definition. The games are powered by leading software developers, Evolution Gaming and Ezugi, who are specialists in the creation of these types of games, offering you a seamlessly smooth experience. Another advantage to playing Live Dealer games is that you can watch all the action unfold in real time, which means you can be fully assured of the results. The dealers deal real cards and spin actual wheels, plus the tables are in complete view all the time. What’s more, there are multiple tables for you to play at, including multi-player and single mode, plus the games are available 24/7. The games include fabulous titles like Live Blackjack, Live Roulette, Live Caribbean Stud Poker, Live 3 Card Poker and Live Baccarat, to name just a few. If you like playing online but you also enjoy the live action feel of the bricks-and-mortar casinos, then Live Dealer is the perfect compromise. Aside from Live Dealer, there are over 300 fabulous slots titles, as well other fun and rewarding casino games, like online roulette, baccarat, blackjack, video poker, and progressive jackpot slots, on offer at Ruby Fortune. These games are powered by some of the biggest, and most influential and innovative, software developers in the industry, like Microgaming. Anyone familiar with their creations will know that their games come with exceptional artwork, cutting-edge animations, rewarding bonus features, crystal-clear audio effects, impressive soundtracks, easy-to-use navigation and ultra-smooth gameplay. When it comes to the incredibly wide variety of slots, you’ll find that there is something to suit everyone, no matter what their budgetary requirements, personal preferences or levels of experience are. Plus, new games are always being released, which means that the collection of games is always expanding and evolving. Also worth noting is that, when it comes to Ruby Fortune’s mobile selection of games, they have all been optimised for play on mobile, which means there is no compromising of quality. The slots games include the classic 3-reel slots, 5-reel video slots and, of course, progressive jackpot slots. 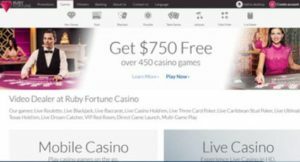 Progressive slots games are incredibly popular at Ruby Fortune, as they are at most online casinos, because they offer the player exciting opportunities to win big bucks. Take Mega Moolah, for example. This famous series of slots games comes with four progressive jackpots, one of which starts at a guaranteed 1 million: each time someone places a bet and plays, a portion of their bet gets added to the jackpot, thereby increasing the amount each time. In other words, you can win way more than 1 million on just one lucky spin. Back to the normal slots and other casino games, some of the most popular titles include Game of Thrones™, Avalon II, Thunderstruck, Tomb Raider™, Classic Blackjack Gold Series, European Roulette, Immortal Romance, Golden Era, Beak da Bank Again, Break Away and Jurassic World™, to name just a few. When you sign up to play at Ruby Fortune, you will instantly become eligible for a generous welcome offer of a 100% match bonus up to C$750, which you can play out on any of the casino games on offer. All you have to do is claim and deposit within 7 days after registration. Take note that your welcome bonus is divided into three parts: in other words it comprises 3 x 100% match bonuses up to C$250, each. Best of all, there is a load of more bonus action to follow. Once you’ve finished with your sign-up offer, you can look forward to daily bonus offers, which are specifically customised around your playing habits and requirements. There is one catch, however, which is that you must claim these offers within 24 hours or else they’ll expire. That said, even if you do miss out on, you can rest assured that the very next day a new bonus will be waiting for you. What’s more, if you do claim in time, and you keep playing even after you’ve finished with the bonus, you could be in line for even more rewards with in-play specials. If that’s not enough, Ruby Fortune also has a great Loyalty Programme, whereby you earn loyalty points every time you place a wager and play. As you accumulate more and more points, you’ll begin to accrue more and more benefits. These benefits are determined by the tier level, which in turn is determined by the amount of points you’ve collected. The tiers are named according to colours and include Blue for starters, followed by Silver, Gold, Platinum, Diamond and Privé. Last, but certainly not least, Ruby Fortune offers daily, weekly and monthly promotions. These are generally themed around new game releases, special events and holidays, and include great prize giveaways like free spins, match bonus offers, casino credits and more. When you play at Ruby Fortune, you can do so with total peace of mind. For starters, it employs state-of-the-art 128-bit SSL encryption technology, which ensures that any and all personal information collected from you by the casino is kept totally confidential. What’s more, when it comes to making deposits or withdrawing any of your funds, you can do so with ease, thanks to Ruby Fortune’s impressive selection of payment mechanisms, which are both globally and regionally specific. Comprising some of the top brand names in e-wallets, prepaid vouchers, credit cards and debit cards, including Mastercard, Visa Electron, Maestro, Trustly, NETELLER, Skrill, and more, you simply have to refer to the Banking page in the software, select the applicable option and follow the prompts to complete the simple and quick procedure. Ruby Fortune has a highly informative FAQ page, which contains all of the most frequently asked questions and their answers. It’s an excellent guide to getting to know more about the casino and all that it has to offer. Alternatively, you can always contact Ruby Fortune’s efficient and super-friendly customer care team. They are on hand via the highly convenient Live Chat facility, or by email if you prefer more traditional modes of communication. Take note that they’re a multilingual service and are available around the clock, so it doesn’t matter what time of the day or night it is, you’ll be able to make contact and get helped with anything from with banking and games, to bonuses, promos, loyalty rewards, and more. Ruby Fortune has plenty of reasons to recommend it. The fun starts with your welcome bonus of a 100% match up to C$750, which is credited across the first three deposits that you make. It then continues with daily offers that are tailor-made to suit you specifically, as well as prize-packed promos and a generous Loyalty Programme. Then there are the games, of which there are hundreds to choose from. Powered by award-winning software providers, the games include slots, progressive slots, blackjack, roulette, baccarat and more. 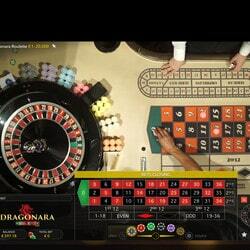 There are also the thrilling Live Dealer games, which allow you to play against real-live dealers in real time, choosing between single-player and multi-player tables. When it comes to being a safe, secure and responsible gaming environment for you to play in, Ruby Fortune has gone all out, with encryption technology to maintain your privacy and some of the best deposit and withdrawal methods around. As for customer support, you can reach them any time you want for first-rate assistance. To join in the fun and put Ruby Fortune to the test, simply register your account and start playing. We think you’ll be pleasantly surprised.